I needed to make a baby card for my brother’s stepdaughter. She and her husband have a beautiful new baby girl named Maya May! Isn’t that just the sweetest name? Our featured stamper over at SCS is PAPERINBLOOM (Carly) and so I CASED this wonderful card . This card is made on a Pretty in Pink 5 1/2″ square card base. Followed by a layer of Crumb Cake, followed by a slightly smaller piece of Crumb Cake that’s been dry embossed with the Stylized Flowers embossing folder from Cuttlebug. My flowers are made with the Tim Holtz Tattered Florals die in Pink Pirouette. They have been sponged very lightly with Pretty in Pink and scrunched a lot to give them dimension. I used some hemp twine in the buttons (retired from SU) and then layered them all. The sentiment is from Stampin’ Up’s Best Wishes and More (retired). 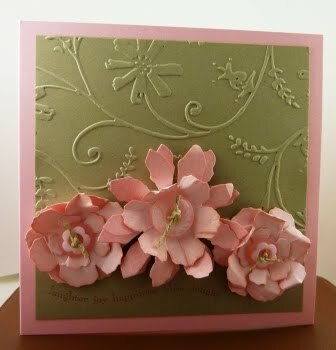 It’s been inked with Regal Rose and then stamped off for a softer look that still shows up on the Crumb Cake cardstock.